HISTORICAL ROMANCE REVIEW with Regan Walker: Shirl Henke’s BROKEN VOWS – Superb Storytelling and an Irish Hunk to Love! 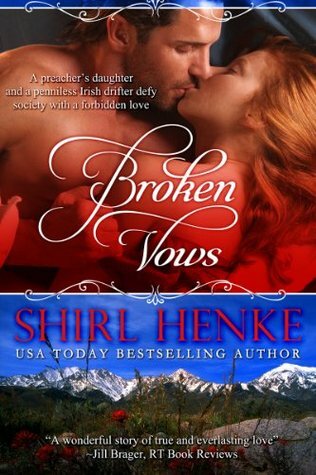 Shirl Henke’s BROKEN VOWS – Superb Storytelling and an Irish Hunk to Love! December is the month where I share my favorite heroes and heroines from the romance novels on my best lists. I’m starting with a great Western romance by gifted storyteller Shirl Henke. Set in Nevada in the late 19th century (beginning in 1870) during the silver boom on the Comstock Lode, Henke delivers a superb tale of young love, prejudice (against the Irish among others), deception, treachery and love’s second chances. I highly recommend it. Rebekah Sinclair, a small town preacher’s daughter, and Rory Madigan, an impoverished Irish immigrant who worked his way West as a prizefighter, meet and quickly fall in love. In a night of passion, they vow to love each other forever and Rory asks Rebekah to marry him assuring her he will find a way to make enough money to win her parents’ respect. However, an evil rich man who wants Rebekah on his arm as he rises in politics conspires to keep Rory from her; his efforts are aided by the bigotry of Rebekah’s family. As a result Rory and Rebekah are separated, each believing they were betrayed by the other. Rory and Rebekah meet again years later when Rory is rich and influential and bent on revenge. But true love will have its day…. I know I’m reading a 5 star novel when I cannot put it down and my emotions are truly engaged. In this case, I also ended up reading it through much of the night, it was that good. Her wonderful characters are richly drawn and her plot weaves an intriguing story. Henke gives us a taste of the West when it was still wild enough that murder and corruption went without retribution, when powerful men used others for their own greed and lust. Then, too, living in America now, we forget the Irish were not just persecuted by the English in Ireland; they were persecuted here as well. Though Rebekah was poor, her family would never consider an Irish Catholic an acceptable husband, no matter how much she loved him. Thank God it’s a romance and all comes right in the end. You won’t regret getting this one! Regan, I tried to portray the prejudices of 19th Century America. Now we take for granted that being Irish or Catholic is no impediment to success, but that was far from the truth in our earlier history. I used this background of the "Robber Baron" era and its abuses of power and even the destruction of people's lives to form the backbone of this plot...where, of course, Rory and Rebekah's love did in the end defeat the forces of evil. Thank you for explaining how this worked in my book. I really appreciate your review!